UK 1st/1st paperback (no hardback issued) - signed, lined and dated by the author. Signed and remarqued by the artist Jana Diemberger. Book one of a projected series. Synopsis : this story is very unique. It is beautifully illustrated with a very eye-catching cover. 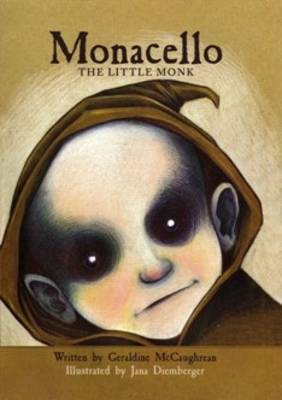 It tells the story of Monacello the little monk, searching for his mother in Italy after being abandoned as a baby. Raised to be poor, dirty and ugly, the city folk deem him to be `bad luck' and the Devil. It runs along with a great textual rhythm and the plot is simple but imaginative, moving and absorbing all in one. Perfect for children and adults: the landscape within this world will stay with you for days.I really look forward to reading the sequels. An orphaned child is dressed as a monk and ostracised by everyone except the roaming wild cats of Naples for his scary looks and his seeming ability to bring both good and bad luck. Monacello searches above and below ground for his parents and finds help from a little girl with mysteries of her own. NOTE - the images shown below were those available when the book was listed - please check, if your purchase depends upon a particular remarque being available.